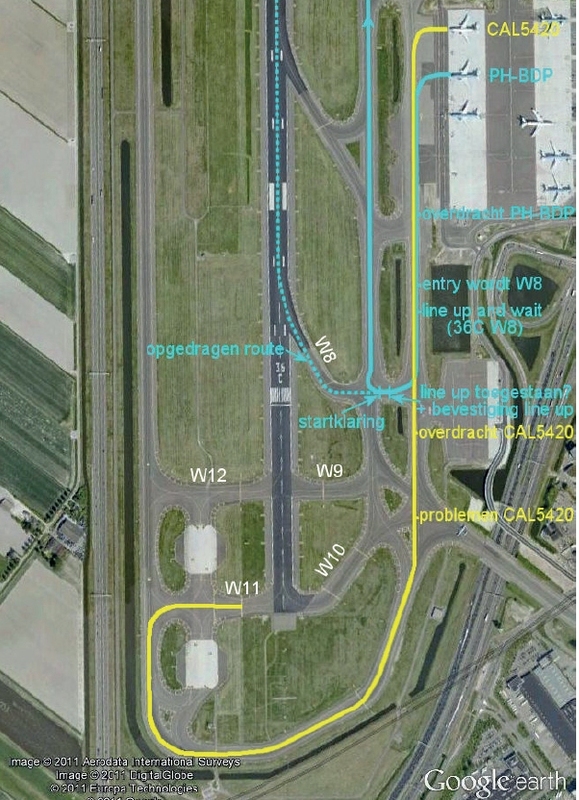 The Dutch Safety Board published the final report of their investigation into a serious runway confusion incident at Amsterdam-Schiphol Airport involving a Boeing 737-300. On February 10, 2010 KLM flight KL1369 was cleared for takeoff on runway 36C at Amsterdam-Schiphol International Airport (AMS/EHAM). Instead, the crew took off from the parallel taxiway B. At the time of the incident, about 20:30, it was dark and it was snowing. The airplane had just been de-iced and was instructed to taxy down taxiway Alpha towards runway 36C. This meant that the crew had to use taxiway Alpha in the opposite direction, contrary to published procedures. Air traffic control is allowed to use this taxiway in the opposite direction if deemed necessary. This is sometimes the case when an aircraft leaves the Juliet platform after de-icing, just like KL1369. The crew were very familiar with the airport and did not use a taxiway map although they were supposed one. The air traffic controller then offered the flight to enter the runway through intersection W-8. At that time a preceding Boeing 747 had taxied the wrong way and was blocking the taxiway. The KLM flight crew accepted the offer because this also meant an opportunity for an expedited takeoff. At that point the crew started losing positional awareness. The workload increased because the an entry in the FMS now had to be changed because the crew had anticipated using intersection W-9. Meanwhile the captain was distracted by radio communications between the air traffic controller and the pilot of the Boeing 747. The crew had to cross parallel taxiway Bravo to enter runway 36C. However, they turned directly onto Bravo and initiated their takeoff roll. The crew did not notice their error and continued their takeoff, passing within about 300 metres of a Boeing 737-400. It appears that the taxiway leading from taxiway Bravo to runway 36C was covered with a thin layer of snow, possibly obscuring the taxiway lights. Also, visibility of the lights of runway 36C was degraded because the lighting pattern matched that of the lights along the highway parallel to the runway. The Dutch Safety Board released the final report of a serious runway incursion incident at Amsterdam-Schiphol Airport, the Netherlands on July 24, 2004. Two Boeing 747-400 aircraft were being towed at Amsterdam-Schiphol Airport. PH-CKC was planning to cross runway 04-22. The other, PH-BFU was planning to cross runway 24 at the same time. 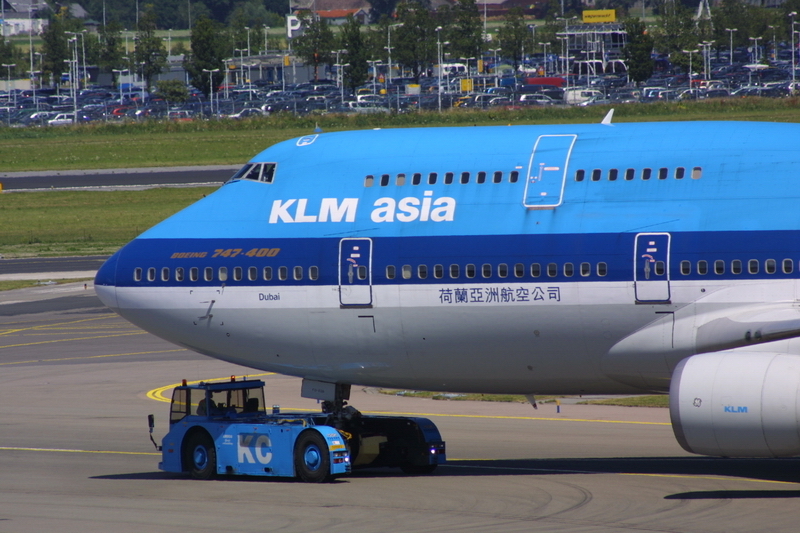 The tow truck driver of CKC noticed the wrong clearance and readback and radioed: “You are not at 04-22 [name].” While the assistant controller was communicating with CKC, the Tower Controller cleared a KLM Boeing 737-300 (PH-BDC) for takeoff from runway 24: “KLM1351 two four cleared for take-off.” At the same time BFU was crossing the same runway at taxiway Sierra 2, located about 1600m from the Boeing 737. The BFU driver overheard this transmission and questioned his clearance: “BFU was at Sierra 2 24, crossing is approved, eh?” The Tower Controller then cancelled the takeoff clearance for KLM1351 which had only just commenced the takeoff roll. The Safety Board concluded that an assumed identity and anticipated clearance are the primary causes. The verification process for the clearance of the tow truck driver did not work because of an automatic subconscious “readback” of the runway id was a precondition for a possible false ‘readback’. Also, adverse conditions may have influenced the intensity of the stop bar lights, combined with the reflection of the sun. The Dutch Safety Board released its final report regarding their investigation into the fatal accident involving a Turkish Airlines Boeing 737-800 near Amsterdam-Schiphol Airport. During the accident flight, while executing the approach by means of the instrument landing system with the right autopilot engaged, the left radio altimeter system showed an incorrect height of -8 feet on the left primary flight display. This incorrect value of -8 feet resulted in activation of the ‘retard flare’ mode of the autothrottle, whereby the thrust of both engines was reduced to a minimal value (approach idle) in preparation for the last phase of the landing. Due to the approach heading and altitude provided to the crew by air traffic control, the localizer signal was intercepted at 5.5 NM from the runway threshold with the result that the glide slope had to be intercepted from above. This obscured the fact that the autothrottle had entered the retard flare mode. In addition, it increased the crew’s workload. When the aircraft passed 1000 feet height, the approach was not stabilised so the crew should have initiated a go around. The right autopilot (using data from the right radio altimeter) followed the glide slope signal. As the airspeed continued to drop, the aircraft’s pitch attitude kept increasing. The crew failed to recognise the airspeed decay and the pitch increase until the moment the stick shaker was activated. Subsequently the approach to stall recovery procedure was not executed properly, causing the aircraft to stall and crash. A Swedish pilot has been arrested by Dutch police at Amsterdam-Schiphol International Airport (AMS/EHAM) for flying commercial aircraft for 13 years with a fake licence. The 41-year-old pilot was about to fly a Corendon Airlines Boeing 737 from Amsterdam, the Netherlands to Ankara-Esenboga Airport (ESB/LTAC), Turkey with 101 passengers on board when he was arrested. Dutch police were notified about the pilot by Swedish authorities. Flight CAI202 was scheduled to leave Amsterdam at 23:30 on March 2 and departed 01:20 the same night after a relief pilot took over. The airplane involved was Boeing 737-4Q8 TC-TJC. The pilot confessed he had been flying for 13 years on a false licence, accumulating at least 10,000 hours flying hours. The man did have a pilot’s licence, but it was no longer valid for passenger aircraft, so he had falsified it. He had worked for airlines in Belgium, Great Britain and Italy. A lawyer for Corendon Airlines commented that the pilot had worked for the airline for the last two years and had “expertly misled the company with his false papers”.